Many people are familiar with the term, Promised Land. However, many do not understand it to be a proper name of an actual place. Instead, they understand it as a place that appeals greatly to someone. For example, some might say that Nashville is the Promised Land for those who love country music. Others might say that Hollywood or New York is the Promised Land for actors. However, to understand what is the true meaning of the Promised Land, we need a study of the Bible. 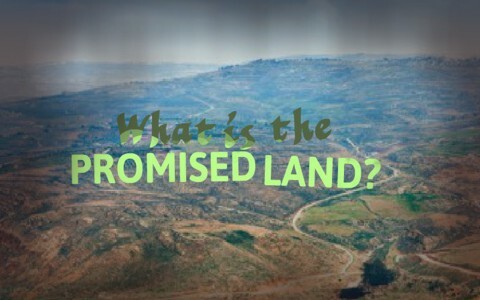 What is the common definition of the Promised Land? The name Promised Land is commonly defined as (1): “(in the Bible) the land of Canaan, which was promised to Abraham and his descendants (Gen. 12:7)”; “a place or situation in which someone expects to find great happiness.” The name “Promised Land” began to be used in the English language around the end of the 1700s and has increased substantially until today (2). What does the Bible say about the Promised Land? The first reference to what would be named the Promised Land is found in Genesis 12 after God called Abram, later known as Abraham, out of his homeland of the Ur of the Chaldees (Genesis 11:24-12:8). The Ur of the Chaldees was an area in Babylon inhabited by people who were not of any significance that worshiped various Gods located in modern day Iraq. However, God called Abram and his immediate family for no apparent reason other than to show them mercy and bless them (Deuteronomy 7:6-11; Peter 2:9-10). When God called Abram, He made promises to Abram that He would show him a land where he could go and establish a great nation. He added that He would make Abram’s name great, bless him, bless those that bless Abram and curse those who curse Abram, and bring it to pass that all the families of the earth would be blessed through him. This is commonly known as the Abrahamic Covenant. This covenant is historically why many people today support the Jewish people and Israel in some cases. This description describes an extensive piece of land from the Nile River to the Euphrates River in Iraq. The boundaries were also described by God in Joshua 1:4 as extending from Lebanon to the Nile River and the Red Sea and eastward to the Euphrates River. When comparing the land that Israel occupies today, to what God had promised, the land today only makes up a small part of the Promised Land. However, God also promised that He would restore the land to them in the last days (Psalms 105:1-11; Jeremiah 16:5-17:1; Zechariah 14; Acts 1:6-7; Romans 11). Finally, while the Promised Land was an inheritance for the descendants of Abraham, by faith, those that have trusted Christ as their Savior are born again as a child of both God and Abraham and they become heirs of the promises made to Abraham (Galatians 3:1-9, 19-29; Hebrews 11:8-19). However, the land will not be the ultimate inheritance. God will make all things new one day and all who have believed what God said about His Son will receive that inheritance that never fades away (Ephesians 1:1-14; Hebrews 11:15; 1 Peter 1:3-5; 1 John 5:9-13; Revelation 21-22). The Promised Land is commonly defined as the land Promised to Abraham in the Bible and a place that appeals greatly to someone. The Bible describes the Promised Land as land that was promised to Abraham and his descendants. By faith, all believers become children of God and Abraham and are made inheritors of the promises made to Abraham. The nation of Israel today occupies only a small part of the original Promised Land. God will restore the Promised Land when He returns to set up His kingdom until such time as He creates a new Heaven and new earth. Read more here: What is the Abrahamic Covenant? Could the Land refer to the areas within our hearts as a Christian? as we spiritualy move into the promised land or gain ground in Chist within? wondering. Hello Mr. Curreen. I don’t believe it is a land that is within our heart but there will be a literal, physical kingdom, the New Jerusalem coming down out of heaven (Rev 21:1-3), and Israel will once again be restored to a physical land. Reading the Book of Isaiah you can see it will have children, farming, worship, and things that are not within the heart only, but in the flesh. I do think you make an interesting point about moving forward spiritual. I still have far to go.